as the ones who read the restoration project section know , i plan to race with my 78 sprint in some french rallyes . first need is to rebuild engine , and need some help for a few questions . -considering workshop manal ,it seems that there are high compression and low compression engines , how can i identify mine considering i find no Numbers on the head and on the block ? 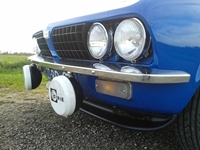 -where can i find parts to modify the steering rack , in order to do a "quick-rack" ? Normally, the engine number should say "HE" at the end, which stands for High Compression. But as far is I know there are no (LE) Low Compression Sprint engines, so consider your engine as High Compression. Some Triumph Toledos came fitted with the pinion that can be used in a Sprint rack to produce a 'Quickrack'. Standard is 3.75 turns lock to lock, quickrack is 3.25. Otherwise as Ronald says try Jigsaw. While your engine is undoubtably a Sprint high compression one as they all were. However, for racing you may want to increase the compression further depending on how much power you want. Most older engines get some way along that path depending on how many times the head has been skimmed and how much has been taken off in total. You can also achieve this by ordering special forged pistons with a partially raised top. I assume you will be using a STR139 cam or something equally wild. Given the valve clearances of only 8/9 thou, a skimmed head and the valves protruding further, you will need to measure the gap between fully open valve and the piston crown cutouts. I certainly had to make mine deeper to avoid touching. From memory we allowed a 3 thou clearance when cold. I know Cambridge Motorsport in the UK have experience with special pistons for Sprints. I didn't use them (ordered direct from USA) and stuck to flat top pistons, but with deeper cutouts. 3 3/4 - Later models. 3 1/2 - nominal 1975 onwards. So it looks like 3 different rack and pinions. The 1850 Parts book July 1973 gives 4 listings for the pinion. The later parts book just list the pinion as NSS. …. which is given as a Toledo pinion ??? Why are the LHS and RHS pinions different but the rack itself is the same ? It is the pinion from a 1300 fwd that is required for a full 'quick rack' which gives I believe 2.75 turns. Our reconditioners tell me they have made them in the past. I have a NOS fwd rack here, which just needs the shorter Dolomite track rods fitting to make a 'quick rack' but it is RHD. The rack bars are the same Tony, as they are straight cut; the pinion skews onto it at an angle, therefore LHD needs to be the mirror image. i must admit i don't understand why the position of the pinion makes a different pinion . Doe it mean the pinion does not enter in the rack with a 90 degrees angle ? The helical gear is mirrored. A rhd one will never fit. I have a new one send together with a rack by a friend to recondition. I will ask where he did buy. It was recently. It is the pinion from a 1300 fwd that is required for a full 'quick rack' which gives I believe 2.75 turns. the fwd rack is 3.25 turns lock to lock, whereas Dolomites, with the exception of early 1850s and the very very earliest Sprints, are 3.75 turns lock to lock. I have a 1976 parts book that covers Dolomites 1300, 1500, 1850 and Sprint (mentions HL for the 1500 and 1850 also). The RH rack is listed as the same for all, The LH rack has a different variant for Switzerland, but no mention as the what the difference is. The different ratios I have come across relate to the number of teeth on the pinion shaft. The standard has 6, giving a nominal ratio of 3.75 and the other 7 which gives a nominal 3.214. If an 8 tooth one exists, then that’s nominal ratio would be 2.81. I’ve not seen one, not surprising as the FWD range are like hen’s teeth in NZ, but given both Carledo and Xvivalve have, that may explain how it is achieved. I’ve found a couple of the 7 tooth pinions and they are interchangeable with the 6 in a standard rack, just needing to be set up as per the workshop manual. However, I wouldn't recommend doing so if there is any significant wear. Having not seen an 8 tooth pinion, nor a FWD rack, I can’t comment, perhaps it is not just the pinion that has to be changed but the entire rack. It would be good to see the answer to this posted on the Forum at some point in the future. I’ve certainly never come across anything other that the standard rack – the bit the pinion moves – certainly none with different teeth spacings. Given inner ball joints screw onto the rack ends forming the stops for rack movement, especially as they wear and are readjusted, the actual turns lock to lock will vary slightly between individual racks, perhaps by as much as +/- 0.1. In all the 105 race meetings I participated in the nominal 3.25 ratio was a good solution at all circuits. Videos on YouTube show most corners were no more than a quarter turn of the wheel and even hairpin was about half a turn (search Dolomite Sprint No 20). Perhaps in say rallying the even quicker 2.75 rack would be of benefit? I’ve found a couple of the 7 tooth pinions and they are interchangeable with the 6 in a standard rack, just needing to be set up as per the workshop manual. However, I wouldn't recommend doing so if there is any significant wear. Having not seen an 8 tooth pinion, nor a FWD rack, I can’t comment, perhaps it is not just the pinion that has to be changed but the entire rack. It would be good to see the answer to this posted on the Forum at some point in the future. has the same components as the early 1850 Dolomites and Toledos except for the track rods. These have the seven tooth pinion. commissioned a batch of ten and also think they are seven toothed). But in the Toledo book there is additional data in the form of a comm number change point which is ADH 4753 (2 door cars) and ADF 61363 (4 door cars) the TKC 462 being the later option, so probably the universal 3.75 pinion. As my own car is ADH 9063, built Dec 73, I can date the change to around early/mid 73. But it is interesting to note that there are early (ADG/ADF) and late (ADH/ADK) Toledos and the pinion change point falls in the early 4 door range but the late 2 door range. The model designation change seems to coincide roughly with the general facelift that included the change from unassisted drum front brakes to servo'd discs. However this COULD merely mean that the slightly "sportier" 2 door got its disc upgrade before the more staid 4 door! Been doing a little research and checking today. My Toledo (the Carledo, ADH 9063 built Dec 73) This is a "standard" late rack, as it should be from the comm number, I bought it with only 2 owners and 41k on the clock and have no reason to think it has ever been changed. With the wheels on the floor, it is almost exactly 3.75 turns, lock to lock. The rack I have fitted to my Sprint, this is of unknown ancestry, but I was told it came off a Toledo of unknown vintage. The car is suspended on axle stands with the wheels and suspension at full drop. This car displays a lock of a gnats whisker over 3 turns, BUT, like Nigels car, the right lock is stopped, not by the rack itself, but by the o/s track rod end coming into contact with the track control arm. Further and also like Nigels car, there is an imbalance between the 2 sides. From centre to full right is 1.25 turns, but from centre to full left is 1.75 turns. Both track rods show a similar amount of spare thread above the track rod end locknuts, so I would say the rack is correctly centred. I'm calling this one "indeterminate" until I can get the wheels back on the ground and recheck as I suspect the suspension dropped condition is responsible for the error. Finally, my "quick rack". This rack came to me fitted to my Sept 78 registered Sprint auto, when I dismantled the subframe for restoration, I checked it out of idle curiosity and found it to be less than 3 turns lock to lock in the bench vise. Further examination today (which i've video'd, just need to work out how to upload it) gives a result of 2 full turns plus around 300 degrees, or close to the 2.81 turns Geoff predicted for an 8 tooth pinion. I know (now) there's no listing for an 8 tooth pinion, but that's what I appear to have! Maybe it's a special tuning part, or just something someone has knocked up in a shed somewhere, whatever its ancestry, it definitely exists cos i have it! I'll edit this to include the video when I can find out how. These are called 2.75 racks. The pinions were st parts but still new available in rhd and lhd. I have one in my road rally dolomite and took it out of a 1300fwd rack.